WHAT ARE ROSE HIPS, LEMON, AND ORANGE PEEL SUPERFOODS? This is my Vitamin-C complex blend that I have been using in my clinic for decades. 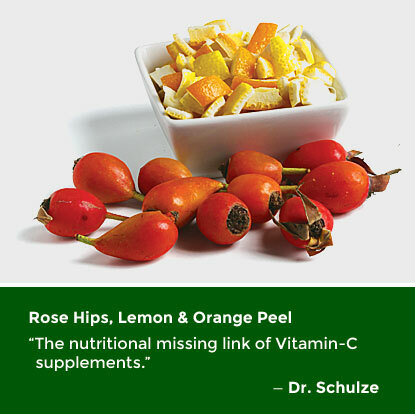 Rose hips, lemon and orange peels are not only a great source of Vitamin-C, but they also contain the extremely important Vitamin-C COMPLEX nutrients—like bioflavanoids, hesperidin, rutin, epicatechin, quercetin, luteolin, calcium and all the many Vitamin-C complex nutrients that are necessary for your body to assimilate and utilize Vitamin-C. This Vitamin-C complex blend is also a very high source of pectin, which removes heavy metals (mercury, lead, etc) from the body. It even removes radioactive and heavy metal contamination, like Strontium 90. WHAT’S IN ROSE HIPS, LEMON AND ORANGE PEEL SUPERFOODS?